My back is killing me. Hopefully, that won’t be the case for too much longer. I was incredibly anxious to read Esther Gokhale’s 8 Steps to a Pain-Free Back. I have significant back problems — I’ve already had two back surgeries several years ago as well as a new injury. You know the drill; degenerative disc disease, herniated discs, nerve pain, osteoarthritis, and so on. So, after physical therapy, cortisone injections, and medication not providing much relief, I’m desperate for anything that could help. Keep in mind, I have pain every day. Sitting, standing, walking, sleeping — you name it. Everything is painful, it’s just a matter of how much. Gokhale’s book is an interesting and new (at least to me) approach to back pain. It theorizes that we suffer a disproportionate amount of back pain in America and suggests that we can fix that problem by improving our posture. She outlines the steps to achieving good posture; the techniques range from stretchsitting to stretchlying to stacksitting as well as standing and walking properly. These techniques focus on elongating and stretching the spine, which has a variety of benefits, not the least of which is alleviating back pain. For instance, stretchsitting decompresses discs and nerves and improves circulation. 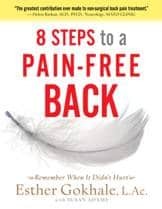 8 Steps to a Pain-Free Back explains the why’s and the how’s in simple terms so that you won’t just do as Gohkale says, but really understand the rationale behind the techniques. I found myself wanting to learn how to stretchsit, because it just makes sense. Every single step (foot placement, neck position, shoulder position, etc.) is documented and demonstrated in photos. I know what you’re thinking: This is like a book of exercises that you can never replicate because the pictures make no sense. Not the case. I was able to copy the technique without difficulty, and I wasn’t very confident going into it. The book is packed with feedback from people who have benefited from Gokale’s method. If I experience a fraction of the relief that others have, I’ll be thrilled. Regardless, it can’t hurt, right? Stretching can’t be a bad thing. Even if you don’t have back pain (is there anyone out there who doesn’t, at some point? ), this book would be a wonderful gift for the person in your life who does. Trust me. If I received this as a gift, I would be very appreciative. Sooo…? How’d it go? Like you, I’m in pain every day because of lower back pain. Might be headed into spinal fusion surgery but because of insurance issues and my own reservations, I haven’t definitely said Yes to it yet. But something needs to change and drastically. I just ordered this book on Amazon but am wondering if you had success with it. Thanks!